An assortment of artisanal chocolates with mouth-watering delicious ingredients. 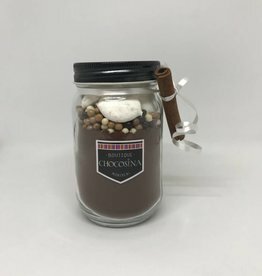 The perfect gifts for chocolate lovers of all ages! Sweet white chocolate pebbles covered in delicious assorted candy flavors: bubble gum, caramel, cola, cotton candy and strawberry. Product of France. These malted chocolate balls are made in delicious chocolate Flavors: Caramel, Dark, Milk, Raspberry, White. The crunchy cereal center is hugged by sublime chocolate and a shimmer candy coating. An assortment of 5 artisanal dark chocolate cookies with natural flakes of nuts and crispy pearls. The cookies are made wholly of dark chocolate. 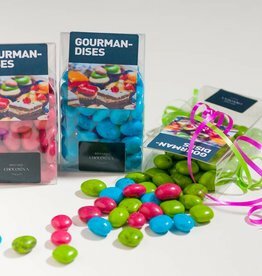 Dark Chocolate Dragées in multicolored candy shells. Hard caramel bites covered in dark chocolate. These delicious french pebbles are made in a green anise artisanal color. Product of France. 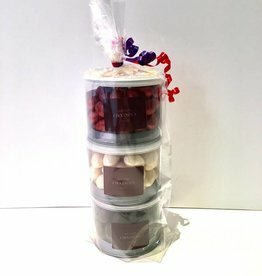 A sublime assortment of 3x 120g Happy Guimmy Candied Marshmallow chocolates wrapped in a clear packaging with colored ribbon. A natural marshmallow center covered in white or dark chocolate and a candy coating in 13 different flavors. Product of France. 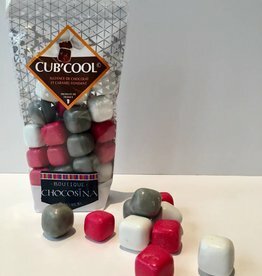 A natural marshmallow center covered in white or dark chocolate and a candy coating in 14 different flavors. Product of France. Divine marshmallow center covered in a rich chocolate layer and enrobed in a natural tasty candy coating. A semi-candied orange peel smothered with 70% cocoa. A signature delight bringing you pure dark chocolate and a zesty orange taste all in one single bite! Hard caramel bites covered in dark chocolate. These delicious french pebbles are made in a raspberry artisanal color. Product of France. Hard caramel bites covered in dark chocolate. These delicious french pebbles are made in a turquoise artisanal color. Product of France.